● On Saturday 25th of August the legendary party from Thailand will move, for the first time in its history, to Spain, specifically to Hierbabuena Beach (Barbate, Cádiz), from 18:00h to 06:00h. ● Cuartero, Nicole Moudaber, Technasia and Dennis Cruz are part of the excellent line-up, of which there are still two important international names to be revealed. ● UV face and body paint, make up artists, giant zip line, performers, fire Poi shows, Led Buddha statues…there wont´be any details missed to make of this first Spanish Full Moon Party an unforgettable memory. The moon and its different cycles has been an endless source of fascination since the first days of humanity. Our ancestors put this satellite in the center of their devotion and never stopped celebrating its existence. Today it could seem that this tight bond would have been blurred but the truth is that it´s unbreakable as the Full Moon Party proves. Born in 1988 spontaneously by a small group of tourists in the Thailand island of Koh Phanganthis celebration has become since then one of the most legendary and known parties in the Asian country. More than 30.000 people congregate every full moon on the beach to discover and experiment that primitive connection with the satellite. 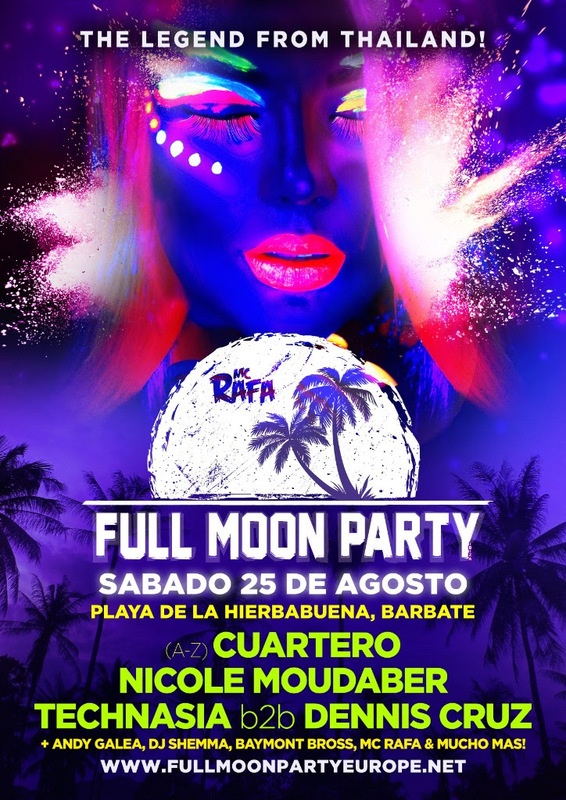 Now, for the first time in its history the Full Moon Party and its symbolic meaning arrives to Spain. The selected date has been Saturday 25th of August and the place chosen is the idyllic beach of Hierbabuena in Barbate (Cádiz). For 12 hours, from 18:00h to 06:00h, the audience will enjoy the performances of big international electronic music artists. The names revealed to date are Cuartero, the DJ and producer from Málaga whose productions have been released on labels such as VIVa Music, Monique Speciale, Cr2, Kittball o Bla Bla; Nicole Moudaber, one of the most powerful artists in the international electronic music scene thanks to her impeccable style that makes of her an unstoppable force of nature; Technasia, the French that has made of Techno Pop his trademark ans that has put the electronic music made in Asia in the center of attention; and Dennis Cruz, artist from Madrid and one of the faces with the bigger repercussion of the moment in the national electronic scene as proves his productions on Saved, Deeperfect, Nervous and Almibar. And all of this when there are still two huge international artists to be revealed. But, although music will have an important prominence this will not be the only incentive of the Full Moon Party in Cádiz. UV face and body paint, a team of make up artists, free flower Lei necklaces, giant zip line, performers, fire Poi shows, 10 metre tall Led Buddha statues are just some of the extras that will be at the audience´s disposal. Don´t think it any more, search in your closet for the whitest clothes you have and be ready to live a nightfall and a sunrise in a unique beach dancing under the full moon. It´s our mission as people and as a commercial entity to do our utmost to care for the environment and to encourage it´s protection. We believe it is our generation´s greatest cause. Organisers will coordinate with relevant authorities to ensure that there is 0 impact on the environment as a consequence of holding the event. Includes: Free UV face and body paint + flower necklace on arrival. Includes: VIP area access + 5 standard drinks + express entry to event + Free UV face and body paint + flower necklace on arrival. 500 € + b.f – Maximum 5 people per table. Includes: 2x750ml bottles of standard spirit of choice & mixers + exclusive, seated reserved area in raised VIP section + Free UV face and body paint + flower necklace on arrival.